Join us in Kerala, India’s pristine and beautiful rejuvenation destination, for an Ashtanga Yoga Teacher Training and Ayurveda Retreat. Immerse deeply in the Ashtanga Yoga practice in this Source of Yoga Teacher Training Retreat. Source of Yoga teacher training programs are registered with the Yoga Alliance and meet their 200 & 500 hour International Certification standards. A Yoga Teacher Training Manual will be supplied to each participant. To those who attend all scheduled classes, a 200 hour Yoga Teacher Training Certificate will be issued, at the end of the course. Returning students and those who have already completed a 200 hour Yoga Teacher Training will receive a 200 hour Advanced Training Certificate, toward 500 hour Certification. The coastal regions of Kerala have a network of waterways, inlets from the sea, estuaries of over forty rivers, lakes and natural canals connecting coastal towns. This interlinked body of waterways is known as the backwaters of Kerala. Over 900 km of the Kerala backwaters are navigable and have been used for centuries by the local people for transportation. One can travel on these waterways on a traditional houseboat and enjoy the scenic beauty of the backwaters in Kerala. A full day houseboat tour is planned for during the retreat. Ayurveda is a natural system of medicine which treats the body and mind and brings about complete rejuvenation. Three Ayurvedic massages are included as part of the retreat experience. Pancha Karma, Ayurveda’s five deep purification therapies, will also be available at Soma Kerala Palace, for an additional cost. The Yoga Teacher Training course, accommodation and Ayurvedic vegetarian meals at Soma Kerala Palace, one houseboat tour in the backwaters, three Ayurvedic massages, evening cultural program, Ayurvedic cooking demonstrations and airport transfers from Cochin International Airport. All levels of Yoga Practitioners are welcome to attend the 200 hour program. The closest International Airport is in Cochin(COK), which is 56km(40 miles) north of the resort. 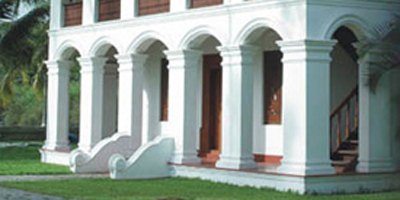 Soma Kerala Palace will arrange for the Airport transfers. A valid Passport and an Indian Tourist Visa are required for entrance into India. This retreat course will take place at Soma Kerala Palace, a luxurious Ayurvedic Spa Resort in the backwaters’s of Kerala. Three delicious Ayurvedic vegetarian meals will be served each day.